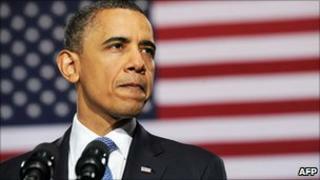 US President Barack Obama has announced his intention to stand for a second term in office in 2012. Mr Obama's team released a video on his official website and sent an e-mail to supporters announcing his plans. The president has an online network of millions of Americans and his web campaign was widely seen as a key plank of his election success in 2008. The announcement was widely expected, and his campaign team are set to file election papers this week. Mr Obama does not actually appear in the video, posted on YouTube as well as the official campaign website. Instead supporters look back to the 2008 campaign and talk of their hopes for the 2012 bid. "I don't agree with Obama on everything but I respect him and I trust him," Ed, from North Carolina, says in the video, a line seen as voicing a perspective aimed at attracting liberals and independents who have criticised some of Mr Obama's policies. In his e-mail to supporters, Mr Obama said the campaign would start small and grow over time, "with people organising block-by-block, talking to neighbours, co-workers, and friends". "So even though I'm focused on the job you elected me to do, and the race may not reach full speed for a year or more, the work of laying the foundation for our campaign must start today." Unveiling a new look for Mr Obama's campaign website, his team told supporters: "The idea is to improve upon what's worked for the past four years, scrap what hasn't, and build a campaign that reflects the thoughts and experiences of the supporters who've powered this movement." Analysts say the president will now work to convince US citizens he has delivered the type of change he promised America in 2008. And during the next 20 months before the presidential election, he will have to defend the policies his administration has worked to impose, like his healthcare overhaul and his efforts to revitalise the economy. It's hardly man-bites-dog that a president will seek re-election. But it is unusual for an incumbent to show his hand before all his likely challengers. One inference is that nervy Republicans have their doubts as to whether Mr Obama is beatable. But another conclusion is that the president knows he has lost ground and support since 2008, and realises he must get out of the blocks quickly. There are a couple of interesting things about the video announcing the campaign. First, Barack Obama is nowhere to be seen. And second, there's a strong grass-roots flavour to it, with individual voters talking about what they can do to help their man - ending in the slogan "it begins with us." This echoes the word-of-mouth excitement about Obama in 2008, but the technique is also reminiscent of the Tea Party. Is the president seeking to emulate their electoral tactics?" Mr Obama's re-election campaign is reportedly seeking to raise as much as $1bn (£620m), an increase on the $750m raised for the 2008 campaign. As the incumbent, Mr Obama's team will be able to call on the support of different donors than they did in 2008, when cash was raised through huge numbers of small individual donations and Mr Obama began the campaign as an outsider. A number of Republican presidential hopefuls are expected to seek the nomination to run against Mr Obama. Mitt Romney and Mike Huckabee are thought likely to run again, with former House Speaker Newt Gingrich and Haley Barbour, currently governor of Mississippi, also tipped to stand. John McCain's 2008 running mate Sarah Palin remains hugely popular with some Republicans but divides opinion nationally. However, as it stands, Tim Pawlenty, the former governor of Minnesota, is the only leading candidate to have formally declared his candidacy. Mr Obama took office in January 2009 with near-record approval ratings, but has seen his support fall during his first two years in office. In particular, Mr Obama will have to overcome pervasive dissatisfaction with the economy. Just 33% of Americans surveyed online by Harris Interactive in March gave Mr Obama positive ratings on his handling of the economy. The figure is unchanged since December, and has not risen above 40% in monthly polling since June 2009. In November 2010, Mr Obama's Democratic Party lost control of the House of Representatives and shed several Senate seats in mid-term elections to Congress. The president called the result a "shellacking" and vowed to listen to the concerns of US voters. Despite shedding some support, polling by the Pew Research Center suggests Mr Obama is in a similar position at this stage to George W Bush and a stronger position than Bill Clinton, both of whom went on to win re-election convincingly. In polling carried out in March, some 47% of registered voters said they would like to re-elect Mr Obama, with just 37% saying they would vote for an as-yet-unknown Republican candidate. Some commentators have pointed to a possible play with numbers in the announcement: Mr Obama's announcement was made on the fourth day of the fourth month of the year, by the 44th US president.